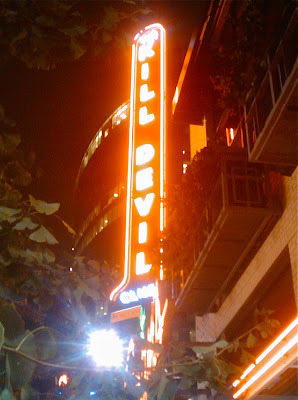 The first thing that impressed me on my initial visit to the Kill Devil Club, a new venue featuring live jazz at the southeast corner of 14th & Main last week, was the volume. Diverse, the evening's featured entertainment, was loud. Really loud. I've seen Hermon Mehari's band perform at least two dozen times, but only the Riot Room has amplified the band to such an extreme level. I loved it. Even so, most of the fifty young and notably attractive people in the room shouted over Diverse's groove-oriented covers of hits by Herbie Hancock and Stevie Wonder. Only Diverse's rendition of "*****'* In Paris" put a halt to the chatter. The second thing that made a big impression on me were the substantial ice cubes that chilled my delicious fresh-squeezed orange juice. So manly! The extensive drink menu is pricey, but the Kill Devil Club's friendly service, swanky decor and dim lighting make alcohol seem like a wise investment. The opportunity to enjoy jazz while contemplating an expansive view of the Power & Light District and the iconic H&R Block building adds to the club's allure. The venue isn't perfect. The small stage is in the central corner of the L-shaped space. Most of the seating, consequently, offers obstructed views of the stage. And the Kill Devil Club's growing pains include an unclear cover charge policy and woefully inadequate advance notification of bookings. The Kill Devil Club has been open for less than a month. A recent string of failed jazz ventures has given advocates of the music numerous reasons to be skeptical. For now, however, the Kill Devil Club serves as a very welcome addition to Kansas City's jazz scene. "The first thing that impressed me... was the volume." Yes, because that's exactly what jazz needs. Something to cover up the subtlety of our dynamics and phrasing. Nothing like having your whole career limited to how loud, fast and high you can play! Anon, I'm not trying to undermine the importance of subtlety of phrasing and dynamics but not everything taught in school is relevant all the time. Maybe part of the reason younger generations don't listen to jazz is because it's too academic too much of the time. High artistic standards are a must, and there's a time and place for everything, but I feel that sometimes "piss and vinegar," volume and balls are more called for than the alternative. Especially at a bar marketing toward a younger demographic. Nobody at Kill Devil is listening for subtlety of phrasing, they're looking for a kickass, swinging good time and loud is par for the course in a situation like that. That's just my take on things. People seem to forget that jazz started as a social music in loud, raucous speakeasies. Also on the streets of New Orleans. Playing with subtlety while marching down the streets was not an option. Kansas City Jazz "took off" partially because of the enthusiasm and the audience interaction. Watch Last of the Blue Devils and see the interaction. A good time was had by all.